Western media and Western donors are often critical to the role that China plays in Africa. China is said to use its foreign aid to curry favour with political leaders in order to get access to natural resources, and to undercut political, social and environmental conditions of Western donors. Many African political leaders, however, like Chinese aid. A prominent example is Uganda’s long-running president Museveni: he is of the opinion that “[t]he Western ruling groups are conceited, full of themselves, ignorant of our conditions, and they make other people’s business their business, while the Chinese just deal with you as one who represents your country”. The negative views of Western media and Western donors, and the positive views of Museveni and his colleagues, may both go back to Beijing’s principle of non-interference into internal affairs and its respect for the autonomy of recipient governments to manage their own development policies. This approach gives political leaders in aid-receiving countries more discretion to choose where to implement development projects compared to the approach of Western donors (despite the Western donors’ lip service to ‘country ownership’ in development cooperation). Museveni and many of his colleagues like the flexibility of this ‘aid on demand’ approach, while many Western donors are at unease with it – they worry that it may enable the aid-receiving countries’ political leaders to site projects according to their personal or political needs, rather than according to the needs of the recipient population. In a recent working paper with Axel Dreher, Andreas Fuchs, Brad Parks, Paul Raschky and Michael Tierney, we test this claim by comparing the subnational allocation of Chinese and World Bank development finance in Africa. A major challenge is to get data on Chinese development finance: official data on the amount of Chinese aid does not exist, and collecting the data is difficult due to the often-blurred boundary between investment and aid, resulting from China’s involvement in large-scale investment projects. 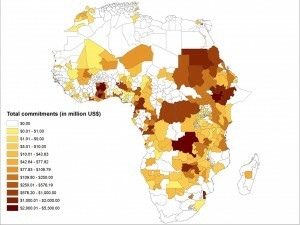 AidData has nevertheless assembled a project-level dataset of Chinese development finance to Africa. For our working paper we have geocoded 1,955 Chinese development finance projects from this dataset for the years 2000-2012. These geo-coded figures, which are also freely available on AidData’s webpage, allow us to track the amount of Chinese development finance given to all subnational administrative regions within African countries. The attached map (See Fig. 1) shows the amount of aid that comes with these projects. As can be seen, China is active across the African continent. The only African countries not receiving Chinese aid are those that officially recognise the Republic of China (Taiwan). More importantly, this figure also documents significant variation, not only across but also within countries — a difference that previous research could not track. We have then used our geocoded data to investigate where Chinese aid goes within African countries. Our empirical results demonstrate that a disproportionate share of Chinese official financing goes to the birth regions of African political leaders. This is true even after controlling for a large number of other factors that might affect the location of a project. Specifically, our results indicate that the average African leader’s birth region receives nearly four times as much (270 percent more) financial support from China during the period of time when he or she is in power. Interestingly, financial support to a politician’s birth region drops quickly when the politician gets out of power. These results suggest that the subnational allocation of Chinese aid is driven to a considerable degree by politics, rather than by poverty or economic potential. They confirm that African political leaders misuse Chinese “aid on demand” approach. To see whether aid from Western donors suffer from the same type of politically driven subnational aid allocation, we have replicated our analysis with data from the World Bank. The World Bank is one of the largest sources of development finance in Africa, and the only Western donor for which subnational data is available for the entire African continent during our sample period. We do not find a similar pattern of politically driven subnational aid allocation for World Bank development projects. World Bank projects are no more or less likely to end up in the home region of the political leader than any other region in the country. A possible reason is that the World Bank grants less discretion to recipient governments and evaluates proposed projects more rigorously. Hence, while Beijing’s principle of non-interference and its ‘aid on demand’ approach may be motivated by good intentions, they seem to make Chinese aid particularly vulnerable to misuse by African political leaders. This misuse may obviously come at the disadvantage of people living in communities with greater need, and might have detrimental developmental effects. In a follow-up project, my co-authors and I will therefore compare the regional growth impacts of Chinese and World Bank development projects. The results will be interesting and are hard to foresee. Sure, the fact that politics drives the subnational allocation of Chinese aid is likely to hamper its growth impact. But Chinese aid may also turn out to have a more positive growth impact, given that China often focuses on infrastructure projects and is well known for actually getting projects done. One practical way to encourage need-based targeting of Chinese (and other) aid is through greater transparency. Development finance institutions can do much more to publicly disclose where they are situating their aid projects and investments. Indeed, careful scrutiny of China’s ‘aid on demand’ approach to foreign aid will become even more important in future years, as China scales up its own bilateral aid program and assumes a leadership position in new development finance institutions, including the Asian Infrastructure Investment Bank and the New Development Bank.